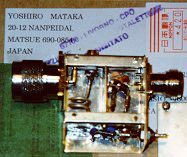 The schematic and the suggestion for this good and easy to build preamplifier good for the EME use also come from Yoshiro, JA4BLC who does not need any presentation. He sent me a working prototype which I replicated with the same good result . Due to the little dimensions a adapter for the fet is recomended even if it is not necessary if you have good eyes and steady hands. 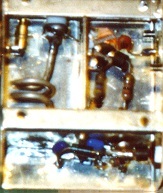 The adapter is made of a little piece of single side copper fiberglass or teflon board, on were are cutted four "islands" were to solder the fet. I built my prototypes into a commercial 50x50x30 mm box, the position of C2 and L1 is not critical, only the two compartments must be RF sealed, you can solder a finger stock on the divisory wall. I completely closed the output side with a square of 5mm thick conductive foam used for cmos protection, this solved some self-oscillation problems I found on the 432 Mhz one. 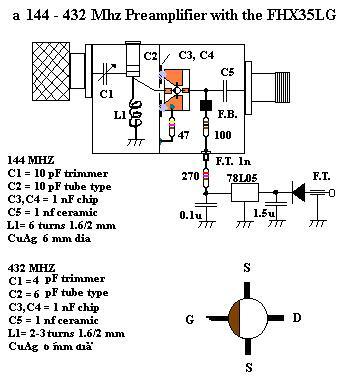 The results should be abt 20 db gain and 0.3 - 0.5 db NF with a drain current abt. 10-15 mA. More to come soon ... Heat up your Iron !